Over the last few centuries, I’ve grown accustomed to getting exactly what I want. Women who aren’t swayed by my good looks–or my reputation in bed–tend to be swayed by my eleven-digit bank account. 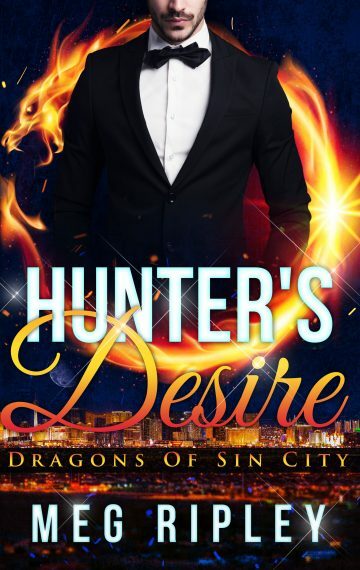 As a brilliant archaeologist, Claire Thomas has plans of her own for her time here in Sin City, but her tempting blue eyes and gorgeous curves are fueling the fire that blazes within every fiber of my body. Her pull over me is more than mere physical attraction, though. As much as she tries to hide it, she has a powerful gift–a gift that could put her in mortal danger if it’s discovered by other dragons. Namely, my brother Damon. I have only two choices: I can betray my family, or I can betray my heart. But no matter how high I soar above the clouds, this enchanting beauty stays with me. Hunter’s Desire is a standalone 30,000 word novella with steamy shifter scenes and explicit language written for readers age 18 and over.